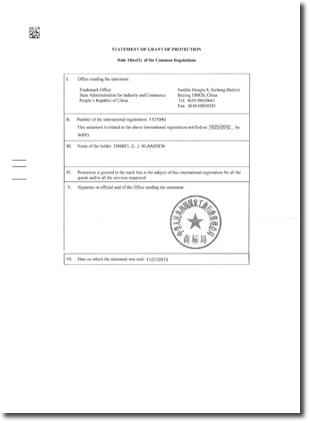 Trade Marks are owned by the Director of Continental Environmental Services Ltd., a limited company registered at Company House showing that the legal entitlement to Continental Environmental Services to use Survey Safe as a Trade Mark within the security of CES certification forms part of the Copyright protection afforded to the certificate. 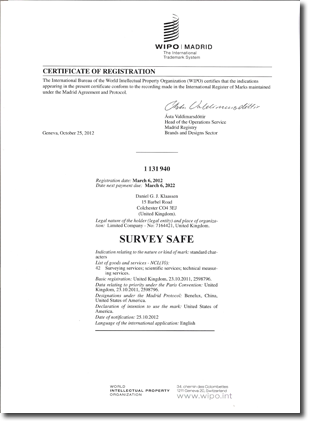 Names related to Survey Safe are protected by the International Property Office and The International Bureau of the World Intellectual Property Organisation (WIPO), the international trade mark system to which registration extends to China. The Trade Marks are public knowledge having been advertised by the International Property Office and The International Bureau of the World Intellectual Property Organisation (WIPO). 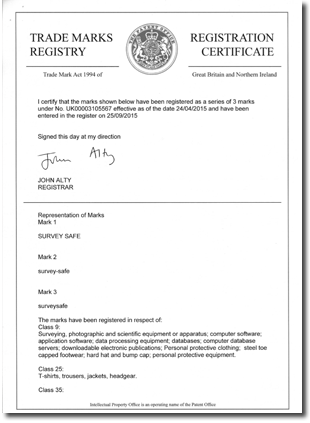 Extending the publication of the Trade Marks to be publically viewed on our website shows that we as responsible and conscientious company ensuring that clients and others in the supply chain understand that Continental Environmental Services retains rights to all certification and that payment must be received to enable them to take ownership as part of compliance in their Health and Safety files.